Hi there. 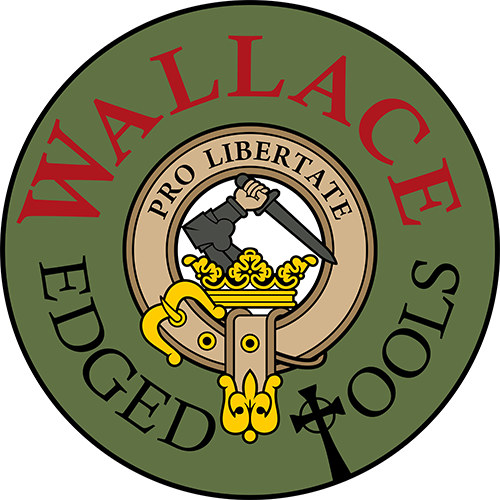 I’m Mike Wallace, and I’ve been making knives since I was 14 years old. Those early knives were made from whatever metal stock I could find and, while they weren’t exactly collector’s items, they worked for my friends and me. Through the years, I fell in love with the art of knifemaking. Now I work full-time for a knife company, manufacturing prototypes. I guess I can’t get enough of knives, so when I come home, I make my own knives. Specifically, I manufacture a handmade line of knives for people who like tough blades that hold a good edge. My knives are made to be ergonomic and easy to use. They have clean, simple lines, look good, feel good, and work well. My knives are serious tools for people who appreciate a fine piece of steel and a razor edge that can go the distance. Near the middle of that chart you’ll find CPM154 compared to other steels like D2, 154CM, and CMPS30V. I can accommodate you if there is different steel you would prefer. These are priced on request. All my knives have a fine Scotch Brite finish unless you request a bead/sand blasted finish. Knives are heat-treated at Peters Heat Treating in Meadville, PA. The handles on my knives are made from a synthetic material called G-10, a glass epoxy composite laminate. It is easy to clean and provides good traction in the hand. You can have your choice of colors. You can also request different handle materials, including micarta, carbon fiber, or stabilized wood. These, like blade steels, are priced on request. The logo coin and tubing on all my knives is either brass or copper. It may be ordered in either a bright or subdued bead/sand blasted finish.